This article is sponsored by Smugglers Notch resort. 2018 has brought many new storylines and faces to professional disc golf. We’ve seen an incredible early run of dominance from Paige Pierce, while traditional powers Paul McBeth and Ricky Wysocki have been knocked out of their recent routine of trading signature victories at the highest level events. The stage has never been bigger for the sport with more content, viewers, and emerging players vying for a spot in the seemingly ever-growing spotlight. As the top-level tours heat up throughout the summer, eyes are starting to shift to the sport’s ultimate prize, a title that redefines careers and lasts well past competitor’s playing days: the PDGA Professional Disc Golf World Championship. Worlds week is slated for September 2-9th, and the shift to a late summer date has allowed the players to reach the peak of their skills for this pinnacle moment of the season. This year, the championship places them at a venue unlike any in our sport, the beautiful Smugglers’ Notch Resort. The #1 Resort in the Eastern U.S. & Canada for 2018 (SKI Magazine), Smugglers’ is not only America’s Family Resort and a top 10 disc golf world destination, but an idyllic location to host a disc golf Major championship. Set in the heart of Vermont and its gorgeous Green Mountains, Smuggs has over 3,000 beds laid out in family condo units, allowing players and spectators to lodge at the location same location as the courses used for the event. Smuggs’ Disc Golf Center features two elite courses, Brewster Ridge and Fox Run Meadows, and it’s all on-site, allowing event-goers to walk or use Smuggs’ free shuttle system to get wherever they need during the event. Find out more about the event on the resort’s website right here. With all the amenities you could dream of at your fingertips – waterparks, hot tubs, restaurants, grocery, craft brews, and activities galore – and discounted rates for Worlds week, now is the time to book your stay for Pro Worlds. On-course spectating is free all week! In order to book, call the Smuggs Vacation Planners at (877) 456-8745 to make your reservation. Planning on coming with a group? Smugglers’ condos fit anywhere from 2-12 people depending on the size of the unit, and rates range from $49-$89/person/night. Smuggs has set up special offers for disc golf clubs that can be accessed by emailing Ben Childs at bchilds@smuggs.com. For those that want the lowest rates on lodging and are hoping to get involved and help with the event, please consider becoming a volunteer. Email discgolf@smuggs.com to connect with our volunteer coordinator. With registration nearly full it’s fair to point out that disc golfers and fans that won’t be competing may have more fun than the players. Not only will you be immersed in the compelling action unfolding on the courses, but the event staff at Smugglers’ has lined up an unparalleled slate of evening offerings that includes four nights of live music, a village fair, craft brews and cider, delicious local food, a fundraiser Texas Hold ‘Em event, and more! 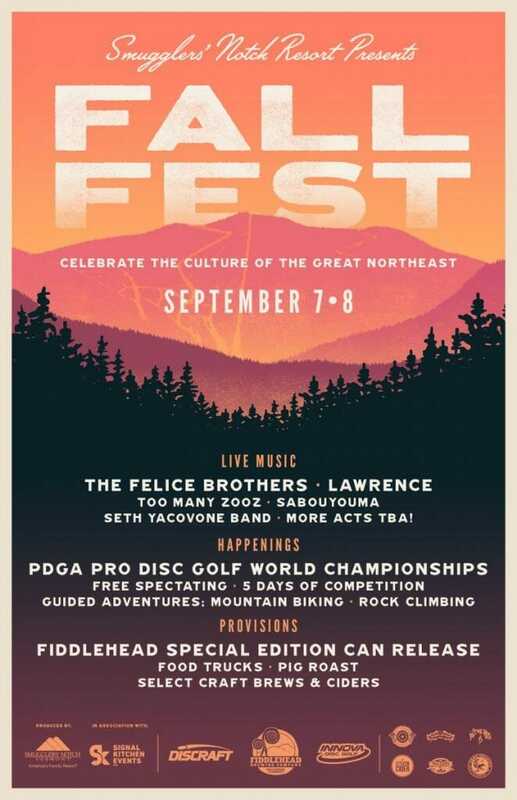 The highlight has to be FallFest, where six bands over two nights will delight crowds of over 1,500, many of whom head out to the courses to spectate the best disc golfers in the world. Event & Tournament Director Jeff Spring has curated the blend of festival and tournament over the past four years and aims to deliver more spectators to the courses through adding auxiliary events that augment the overall experience. This year, Smuggs has stepped up the talent, and tickets are now on sale and going fast. Don’t wait to purchase, and don’t forget that if you’re lodging at the resort, you can add on tickets for a discounted price! One of the many areas of growth for disc golf is in the media. Smugglers’ Notch Resort and the PDGA are proud to announce production of an hour-long program that will be aired on Outside TV and feature the 2018 PDGA Pro World Championships! The production will tell the story of the entire event, including the mountain lifestyle at Smugglers’ Notch Resort, the fun and festive atmosphere created through Smuggs’ FallFest, as well as insight into the sport and its athletes. There will be features on several touring pro disc golfers competing in the event, as well as shot-by-shot coverage from the final round. Outside TV is the leading video provider for the adventure sports and outdoor lifestyle category. Outside TV delivers high-quality, compelling storylines focused on a wide variety of sports, as well as the full spectrum of the lives of those who engage in them. Their Emmy Award-winning content is distributed through multiple platforms, including national cable, satellite and OTT providers, outsidetv.com, social media, and their app, Outside TV Features. Outside TV’s content is broadcast in more than 100 markets that represent over 61 million potential viewers. More details on the event’s comprehensive media plan will be released as the event approaches. The production of the Outside TV broadcast is being made possible by our fantastic course partners, Innova Champion Discs and Discraft. As premier partners they will lead the bevy of disc golf brands involved in the World Championships, a tournament that looks to be inclusive of all disc golf partners willing to support the premier event in our sport. The PDGA and Smugglers’ Notch Resort thank both Innova and Discraft them for their contributions to making this an unforgettable event. Discraft is our premier course sponsor for Brewster Ridge Disc Golf Course. This 8,000-foot wooded beauty is one of the highest-rated courses in the world. Discraft has been a long-term partner with Smugglers’ Notch and we are thrilled to have them on board as a leading sponsor for the 2018 World Championship. Innova is our premier course sponsor for Fox Run Meadows. Coming in at over 9,300 feet, Fox Run is the more open of the two courses. Playing through meadows, light woods, and around a basin, competitors need big distance but can’t lose accuracy, as many holes play near wetland areas creating a substantial amount of out-of-bounds to contend with. Both courses have been getting upgrades, small tweaks, and substantial beautification by the full-time course crew at the Smugglers’ Notch Disc Golf Center, meaning they will be in fantastic shape come Pro Worlds. Both will be featured in the Outside TV broadcast, and Smugglers’ is excited to make sure they represent the sport well at its highest level. For those disc golf companies interested in supporting and partnering with the event, please contact Jeff Spring at jspring@smuggs.com as there are still partnership opportunities available. Stay tuned for more news and updates on disc golf’s premier event, as we’ll be sharing about more of our great partners, media, and event details soon. 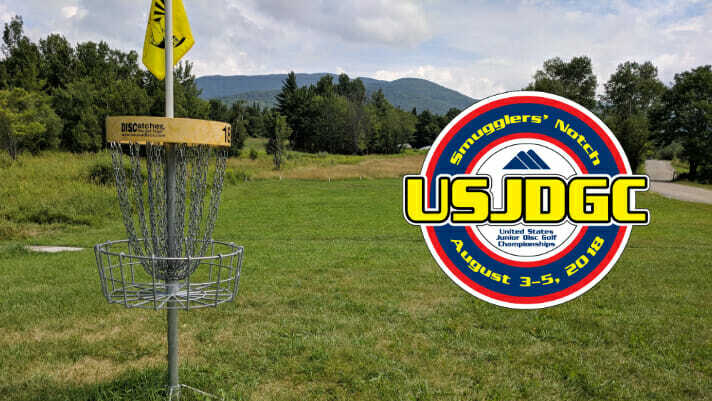 On top of the Pro World Championships, Smugglers’ already hosted the inaugural United States Junior Disc Golf Championship, directed by Kids Disc Golf August 3-5th. Make sure to check out results and pictures from the event here! Comments on "The Season’s Can’t Miss Event: Pro Worlds At Smugglers’ Notch Resort"